We’ve been chatting about working edible plants into our landscapes a lot lately, and there’s probably more to come. It’s just such a great subject, and it opens the door to a lot of creativity in the garden as well as the kitchen. It’s all part of The Arbor Gate’s concept of Ornamedibles. Let’s cover a very efficient way to work edibles into the existing landscape – taking it to the vertical. There are several edibles that can be grown vertically, and some that actually perform better this way. Some vegetables and garden fruits are known as space hogs – cucumbers, vining squashes, cantaloupes, gourds, pumpkins, watermelons, and even sweet potatoes. Check the seed packages and you will see that they have spacing requirements of 6’, 8’ and even up to 10’ – 12’; not terribly practical for the typical suburban garden. 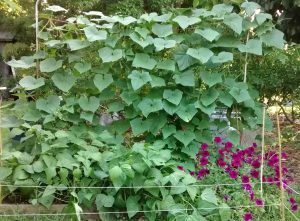 Other vining edibles have always needed a place to climb; pole beans, peas, and tomatoes. All of these can be grown vertically, some taking up as little as 1’ x 3’ of horizontal garden space. To garden vertically we need supports. Here’s where your creativity can take off. There are so many options – trellises, arbors, pergolas, tuteurs, tripods, teepees, pyramids, cages, fence panels, A-frames, and all sorts of DIY projects. The support must be sturdy enough to hold the vines and the load of fruit, and tall enough to accommodate the expected reach of the mature plant. As long as you meet those two requirements, the rest is just pure design choice. 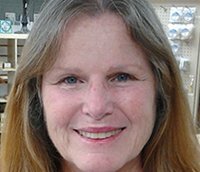 Your nursery professional can help you make a solid selection that suits your aesthetic. In most cases, the support will eventually be so covered with stems and leaves that it nearly disappears, but it will serve as a garden ornament until the plant reaches that state. Keeping this in mind, you can choose decorative objects in metal or wood that offer style and color on their own, or opt for a rustic natural appearance that will blend into your garden space all season. Choose a location that meets the lighting, irrigation, and drainage needs of your intended edibles. The neighboring plants should have similar water needs – it would be difficult to plant watermelons in a succulent garden and expect both to do well. You can pull off some pretty interesting combinations by using low volume irrigation techniques – drippers, micro-sprayers, or water bulbs. Before you set the support in the garden, you must prepare the soil where it will stand. You don’t have to rework the whole bed, just the space in which the edible crop will grow. I call this “pocket planting” and it is a great way to work edibles into existing garden beds. Clear the area, broadcast your favorite slow release organic fertilizer, toss out a couple of handfuls of dried molasses, and apply 2” of top quality compost. Cultivate all of this into the top 6” – 8” of soil. It doesn’t need to be deeply tilled in, just mixed well by hand or with a small cultivator. Set your support in place, and make sure it is anchored well. Remember that the heavy leaf cover of a mature plant can act like a “sail” in the wind. Make sure it won’t topple over in a surprise storm. I use rebar stakes or small, lightweight T-posts that are designed for rabbit fencing. Even a support that has “feet” may need to be staked. After your pocket is prepped and the support is in place, water the area well. If possible, do this a day or two before planting. This settles the soil and makes sure it is evenly moist when you plant. If you need to plant immediately, try to wait at least an hour between watering and planting. Most of the vining edibles are planted by seed. An exception would be sweet potatoes, which are planted using slips or rooted shoots and tomatoes which are grown from transplants. Plant the seeds of your edibles at the base of the support. Keep them well watered during the germination phase. Even drought tolerant edibles, such as gourds, need to remain moist until they have formed several sets of true leaves and have a good root system established. Some vining edibles will need a bit of coaxing to start climbing. Once they take hold, the tendril formers such as cucumbers and melons will happily climb on their own. The ramblers, like sweet potatoes or tomatoes, will take a bit of guidance to start their upwardly mobile advance. Other than the space savings that vertical gardening provides, there are a couple of other advantages that make it worthwhile. Getting the vines up off the ground increases air circulation, drying them quickly after rainfall or irrigation. This decreases exposure to some of the fungal diseases that can affect them. Pollinators have complete access to the blooms, and crawling pests have decreased access. Vine inspection is easy, so problems can be nipped in the bud. Harvesting is very easy, no crawling around on your knees. Weed management can be as simple as mulching at the base – no nightmares of trying to navigate through 10’ of brittle vines. Cucumbers, beans, peas, small squashes and baby pumpkins are self-supporting on the vines. But larger vining edibles will need some attention once they get to the size of a softball. Slings of cheesecloth, burlap, or old sheeting can be tied to the support and used to cradle fruits like cantaloupe or honeydews as they increase to harvest size. When you are choosing your support, this should be one of the things you consider. Match the sturdiness of the support to the weight of the crop. Choose varieties that are suited to this technique. There are selections of pumpkins known as the “sugar babies” that are smaller than a carving pumpkin. They are just the right size for a few pies or a pot of pumpkin soup. Ice box watermelons weigh only 8 – 10 pounds. They are super sweet, easier to refrigerate than a full sized variety, and they mature a little faster, too. Be sure to listen to our Green Thumb Podcast No: 16 – Edible Landscaping and Happy Gardening!